Atlantis series is "InductoSeal" material construction that prevents overheating and is more hygenic. They are safe to use on all heating elements, including induction. Will last for years to come without deforming and warping. Atlantis series is "7-PlyMaterial" construction that ensures an even heat distribution. They are safe to use on all heating elements, including induction. Will last for years to come without deforming and warping. The Demeyere Atlantis sauce pans feature an "InductoSeal" base that reduces overheating and provides excellent heat distribution. Although it was specifically designed to withstand the rapid heating of induction burners, they function extremely well on all heat sources. With a 25 year manufacturers warranty these pans will last for years to come without deforming, warping, or loosened handles. The Matfer Bourgeat Excellence 1 3/4 QT Sauce Pan has a reinforced no drip edge, stainless steel body, welded handle, and is induction ready. The Matfer Bourgeat Excellence 1 QT Sauce Pan has a reinforced no drip edge, stainless steel body, welded handle, and is induction ready. The Matfer Bourgeat Excellence 2 3/8 QT Sauce Pan has a reinforced no drip edge, stainless steel body, welded handle, and is induction ready. The Matfer Bourgeat Excellence 4 3/4 qt. 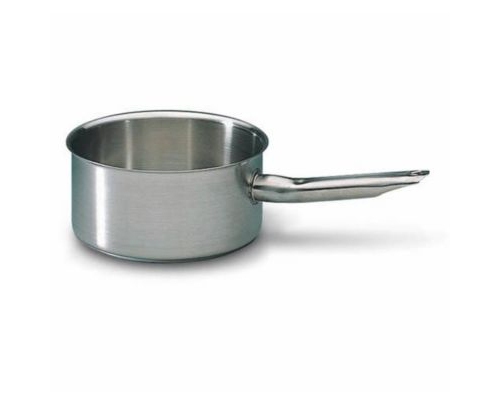 Sauce Pan has a reinforced no drip edge, stainless steel body, welded handles, and is induction ready. The Matfer Bourgeat Excellence 4 QT Sauce Pan has a reinforced no drip edge, stainless steel body, welded handle, and is induction ready. The Matfer Bourgeat Excellence 7 7/8 in. 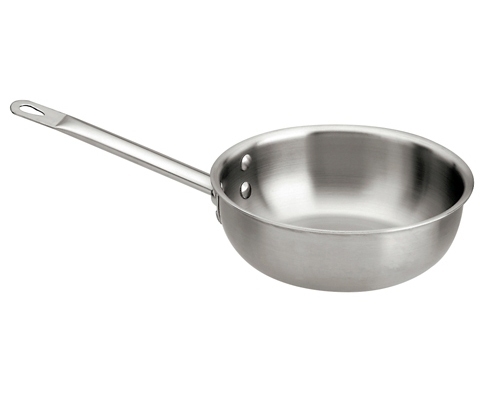 Saute Pan has a reinforced no drip edge, stainless steel body, welded handle, and is induction ready. The Matfer Bourgeat Excellence 9 qt. 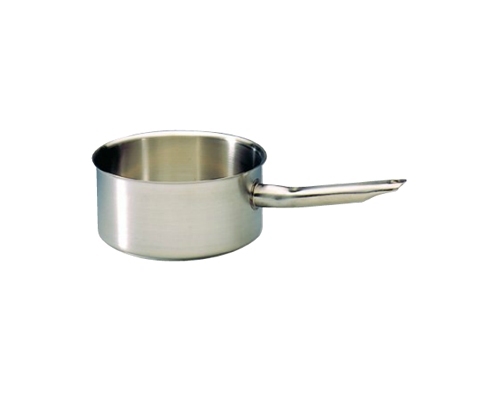 Sauce Pan has a reinforced no drip edge, stainless steel body, welded handles, and is induction ready. Weight: 5 lbs. 10 oz. The Matfer Bourgeat Tradition 9.5 in. 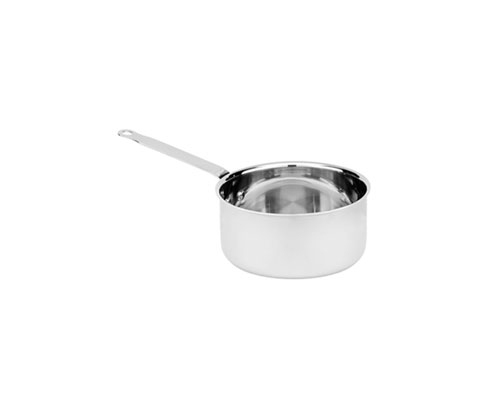 Flared Saute Pan is a medium sized stainless steel pan with a non-drip edge and welded insulated handle. Works with all heating elements, including Induction. The Paderno Pro .4 qt. 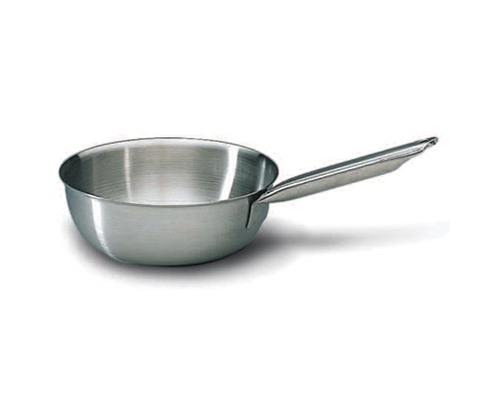 Sauce Pan is used for heating liquids or reducing sauces. Features two spouts for easy pouring. The handle stays cool, and is solidly affixed with forged rivets. Works on all cooking surfaces, including induction. Care: Dishwasher safe, but hand washing recommended. Compatible cook tops: Compatible with all cooking surfaces, INCLUDING induction. Oven safe. Material: High polished 18/8 grade stainless steel. Handles are firmly riveted to the highly polished pans and stay cool to the touch. The Paderno Pro .7 qt. 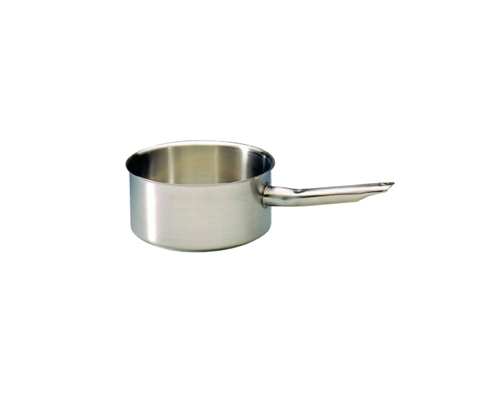 Sauce Pan can be used to make a couple of hard boiled eggs, or to reheat sauce or soup. The handle is hollow, which allows it to stay cool during use, and is solidly affixed with forged rivets. Works on all cooking surfaces, including induction. The Paderno Pro 1 1/2 qt. 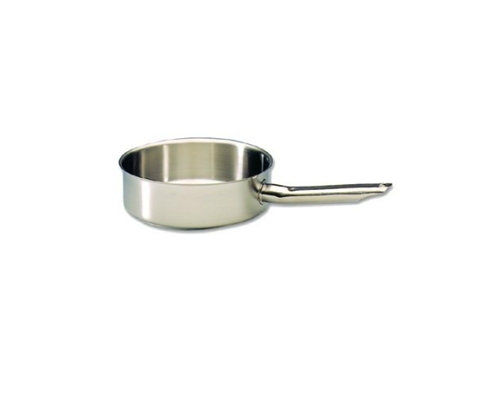 Sauce Pan is perfect for preparing hard boiled eggs, heating up soups, or even steaming vegetables. The handle is hollow, which allows it to stay cool during use, and is solidly affixed with forged rivets. Works on all cooking surfaces, including induction. Material: Brushed 18/8 grade stainless steel. 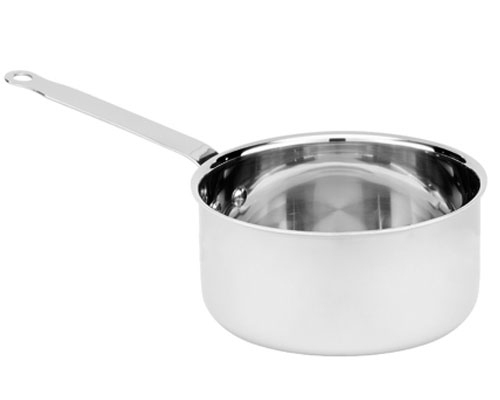 Handles are firmly riveted to the highly polished pans and stay cool to the touch. Paderno Pro Saucier Pans are made in Italy with the best 18/8 grade stainless steel, high polished and have a lifetime warranty. 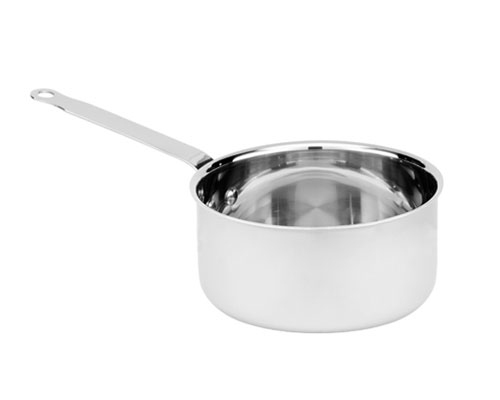 Handles are firmly riveted to the highly polished pans and stay cool to the touch. These pans are well known for commercial use, but are perfect for home use as well. Works with all heating elements, including induction. - Capacity: 1 1/4 qt. - Diameter: 6 1/4 in. - Height: 2 3/8 in. - Capacity: 1 5/8 qt. - Diameter: 7 1/8 in. - Height: 2 1/2 in. 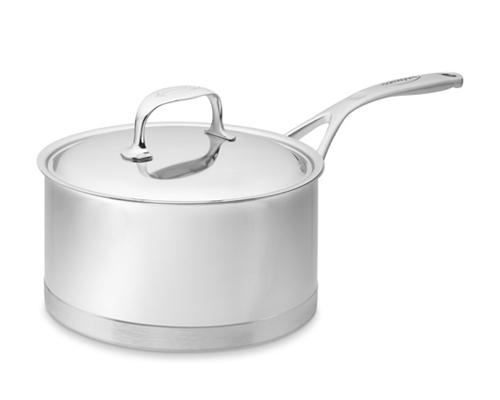 The Paderno Pro 1 qt. 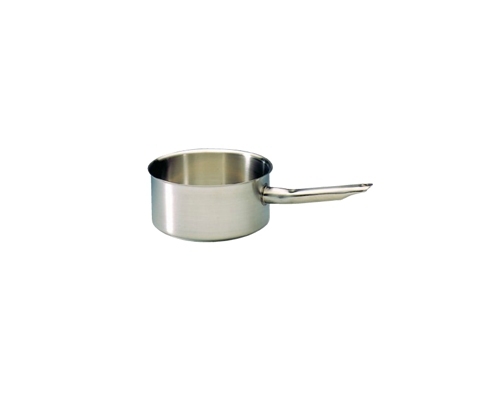 Sauce Pan can be used to boil up a couple of eggs, or to heat up your favorite sauce or soup. The handle is hollow, which allows it to stay cool during use, and is solidly affixed with forged rivets. Works on all cooking surfaces, including induction. The Paderno Pro 2 1/8 qt. Sauce Pan is perfect for preparing a few hard boiled eggs, heating up soups or creating sauce from scratch, or even steaming vegetables. The handle is hollow, which allows it to stay cool during use, and is solidly affixed with forged rivets. Works on all cooking surfaces, including induction. - Capacity: 2 1/8 qt. - Diameter: 7 7/8 in. - Height: 2 3/4 in. Use the Paderno Pro 2 5/8 qt. 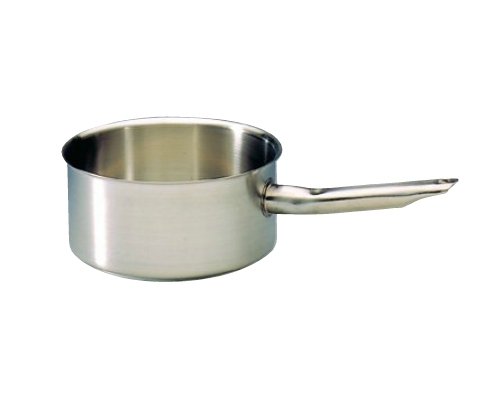 Sauce Pan for preparing pasta or rice, creating delicious sauces, or steaming vegetables. The handle is hollow, which allows it to stay cool during use, and is solidly affixed with forged rivets. Works on all cooking surfaces, including induction. The Paderno Pro 3 qt. Sauce Pot is the perfect size to prepare small batches of your favorite stews, soups, sauces and stocks. Works on all cooking surfaces, including induction. Paderno Pro Sauce Pots are made in Italy with the best 18/8 grade stainless steel, high polished and have a lifetime warranty. Handles are firmly riveted to the highly polished pans and stay cool to the touch. These pans are well known for commercial use, but are perfect for home use as well. Works with all heating elements, including induction. - Diameter: 4 3/4 in. - Diameter: 9 1/2 in. - Height: 3 3/8 in. The Paderno Pro 5 qt. 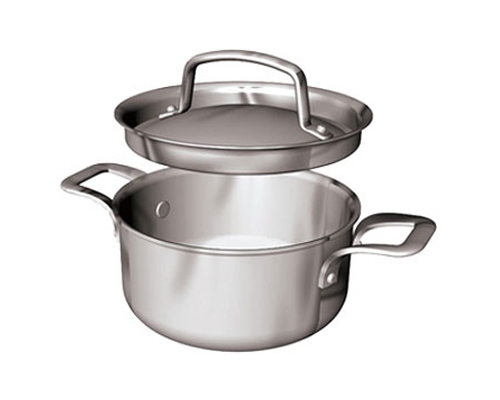 Sauce Pan is an excellent choice when preparing pasta or rice, creating delicious sauces, or steaming vegetables. The handle is hollow, which allows it to stay cool during use, and is solidly affixed with forged rivets. Works on all cooking surfaces, including induction. Use the Paderno Pro 5 qt. Sauce Pot when preparing your favorite stews, soups, sauces and stocks. Works on all cooking surfaces, including induction. The Paderno Pro 7 qt. Sauce Pot can be used when preparing stews, soups, sauces and stocks. Works on all cooking surfaces, including induction. The Scanpan Classic 1 quart Sauce Pan is a multifunctional non stick pan. The perfect size for boiling a couple of eggs, and heating up sauce or soup. Features a glass lid that had a stainless rim, making it easy to check on your food's progress without losing heat. 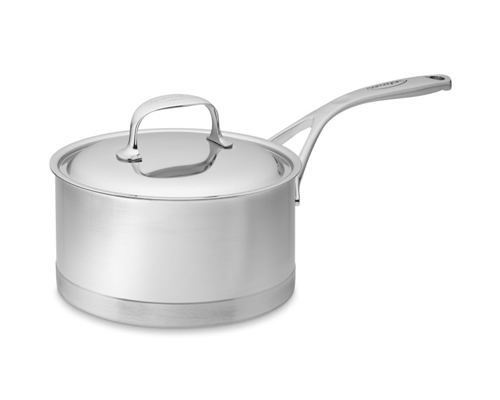 The Scanpan classic line construction is squeeze cast aluminum encased in ceramic titanium. Nonstick surface guaranteed against warping. Oven proof up to 500F. Metal utensil safe. Diameter: 6 in. Care: Dishwasher safe, but nothing beats hand washing. Compatible cook tops: Compatible with all cooking surfaces, EXCEPT induction. Oven safe to 500°F. Material: Squeeze cast aluminum encased in ceramic titanium construction, great heat retention, and no hot spots. Ergonomic non riveted polymer handles. 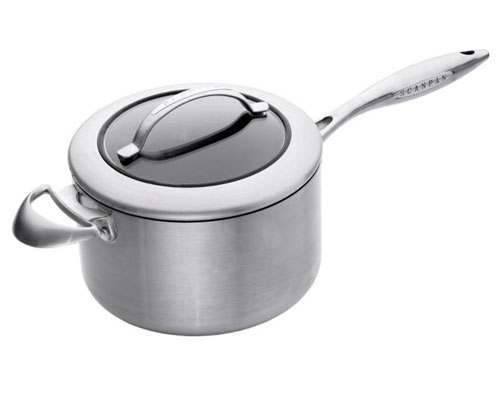 The Scanpan Classic 2 3/4 quart Sauce Pot can be used to prepare soups, stews, stocks, sauces and more. This multifunctional sauce pot comes with a glass rid that allows you to track your food's progress without losing heat by lifting the lid. 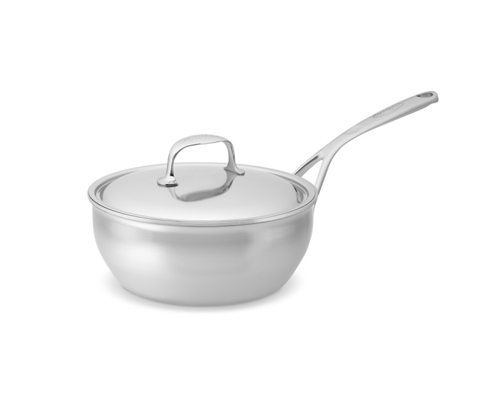 The Scanpan classic line construction is squeeze cast aluminum encased in ceramic titanium. Nonstick surface guaranteed against warping. Oven proof up to 500F. Metal utensil safe. Diameter: 8 in. Care: Dishwasher safe, but nothing beats hand washing. 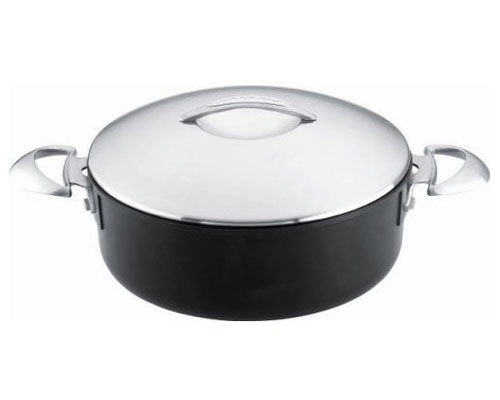 The Scanpan Classic 2 quart Sauce Pan is a multifunctional non stick pan. 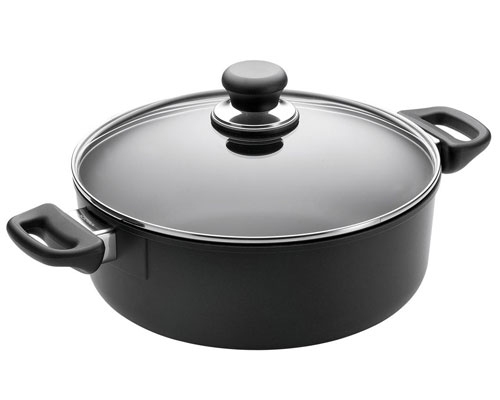 The perfect size for boiling eggs, heating up soup, or steaming your favorite vegetables. Features a glass lid that had a stainless rim, making it easy to check on your food's progress without losing heat. 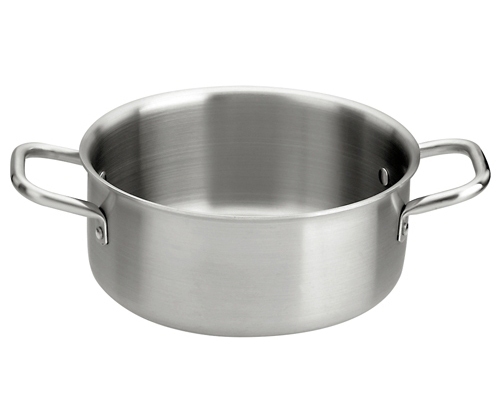 The Scanpan classic line construction is squeeze cast aluminum encased in ceramic titanium. Nonstick surface guaranteed against warping. Oven proof up to 500F. Metal utensil safe. Care: Dishwasher safe, but nothing beats hand washing. 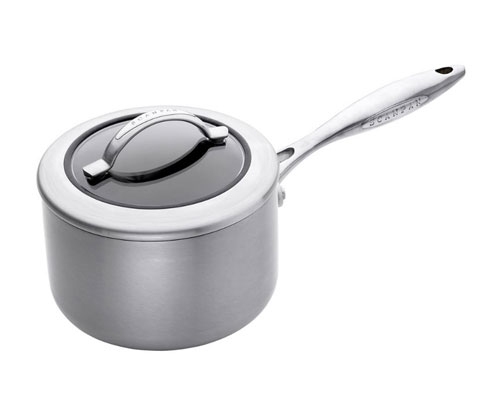 The Scanpan Classic 3 1/2 quart Sauce Pot is ideal for making stews, soups, sauces and stocks. This multifunctional sauce pot comes with a glass rid that allows you to track your food's progress without lifting the lid and letting all of the heat out. 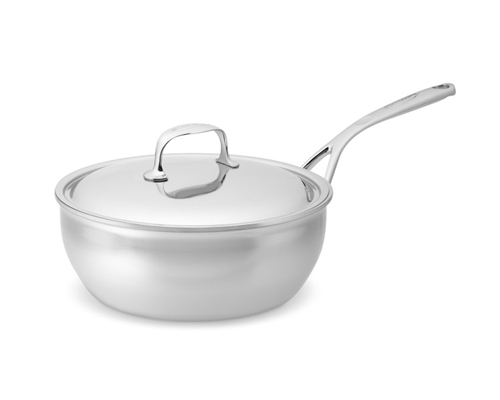 The Scanpan classic line construction is squeeze cast aluminum encased in ceramic titanium. Nonstick surface guaranteed against warping. Oven proof up to 500F. Metal utensil safe. Diameter: 9 1/2 in. Care: Dishwasher safe, but nothing beats hand washing. The Scanpan Classic 3 quart Sauce Pan is a multifunctional non stick pan. Ideal for preparing pasta or rice, steaming vegetables, or boiling eggs for deviled eggs. Features a glass lid that had a stainless rim, making it easy to check on your food's progress without losing heat. 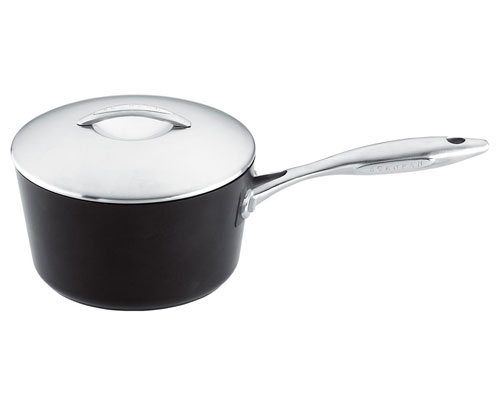 The Scanpan classic line construction is squeeze cast aluminum encased in ceramic titanium. Nonstick surface guaranteed against warping. Oven proof up to 500F. Metal utensil safe. The Scanpan Classic 5.5 QT (11 in.) 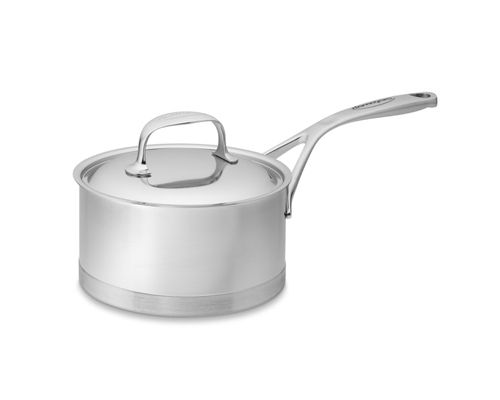 Covered Sauce Pot is the largest sauce pot in the Scanpan Classic Series. This Sauce pot is perfect for preparing your favorite stews, soups, sauces and stocks. This multifunctional sauce pot comes with a glass rid that allows you to track your food's progress without lifting the lid and letting all of the heat out. 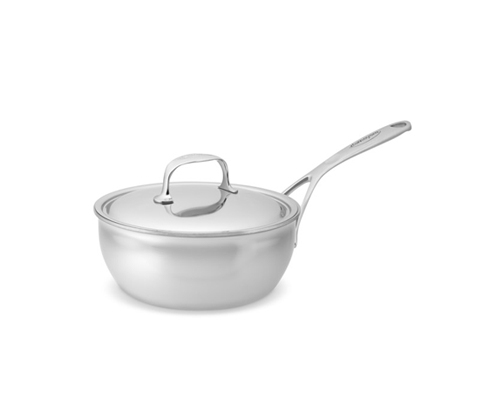 The Scanpan classic line construction is squeeze cast aluminum encased in ceramic titanium. Nonstick surface guaranteed against warping. Oven proof up to 500F. Metal utensil safe. The Scanpan CTX 2 3/4 qt Sauce Pan is the perfect size for boiling a couple of eggs or heating up soup or sauce. Comes with a brushed stainless steel lid with a glass window. The Scanpan CTX line of cookware is suitable for all cooktops, including induction. The design features alternating layers of stainless steel and aluminum for professional-level temperature control and curvy ergonomic handles. Compatible cook tops: Compatible with all cooking surfaces, including induction. Oven safe to 500°F. Material: Squeeze cast aluminum encased in ceramic titanium construction, 18/10 stainless steel exterior, great heat retention, and no hot spots. "Stay Cool" stainless steel ergonomic handle oven safe up to 500°F. The Scanpan CTX 2 QT. 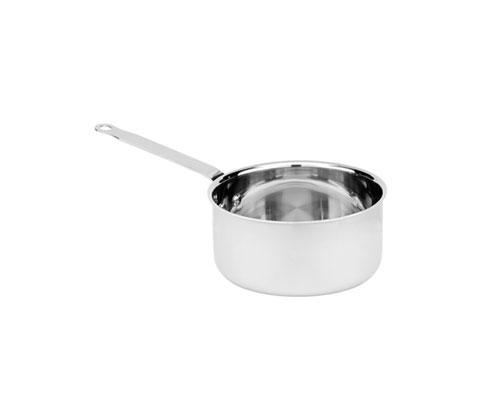 Sauce Pan is the perfect size for boiling a couple of eggs or heating up soup or sauce. Comes with a brushed stainless steel lid with a glass window. The Scanpan CTX line of cookware is suitable for all cooktops, including induction. The design features alternating layers of stainless steel and aluminum for professional-level temperature control and curvy ergonomic handles. 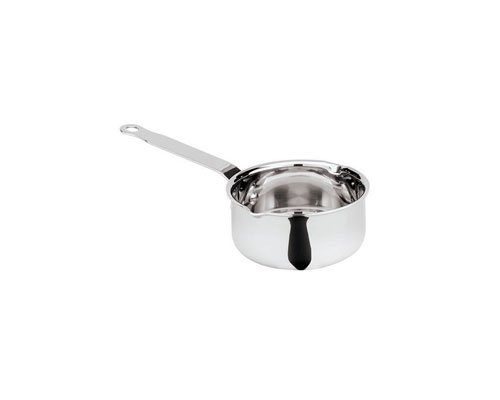 The Scanpan CTX 4 qt Sauce Pan is the perfect size for boiling a couple of eggs or heating up soup or sauce. Comes with a brushed stainless steel lid with a glass window. The Scanpan CTX line of cookware is suitable for all cooktops, including induction. The design features alternating layers of stainless steel and aluminum for professional-level temperature control and curvy ergonomic handles. The Scanpan Professional Scanpan Professional 1 Quart Sauce Pan is ideal for preparing a couple of hard boiled eggs, and heating up sauce or soup. A brushed stainless steel lid is included. 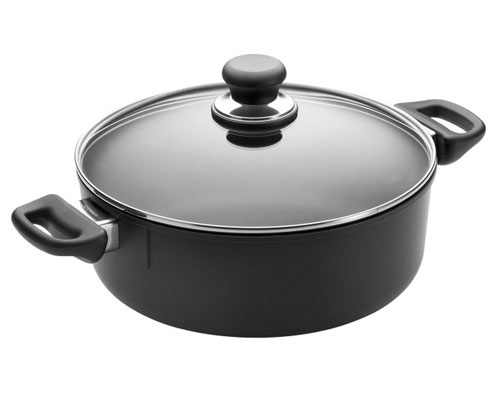 The Scanpan Professional line construction is squeeze cast aluminum encased in ceramic titanium. Nonstick surface guaranteed against warping. Oven proof up to 500F. Metal utensil safe. Material: Squeeze cast aluminum encased in ceramic titanium construction, great heat retention, and no hot spots. "Stay Cool" stainless steel ergonomic handle oven safe up to 500°F. The Scanpan Professional Scanpan Professional 2 Quart Sauce Pan can be used to steam vegetables, heat up sauce or soup, and boil eggs. A brushed stainless steel lid is included. 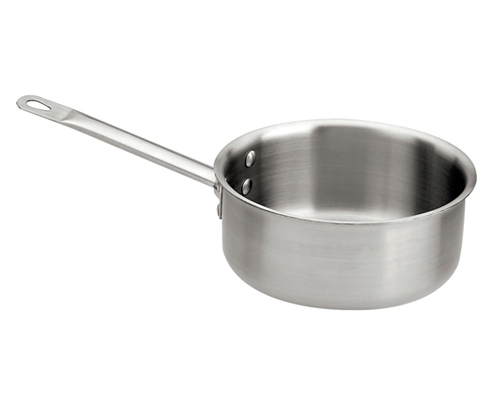 The Scanpan Professional line construction is squeeze cast aluminum encased in ceramic titanium. Nonstick surface guaranteed against warping. Oven proof up to 500F. Metal utensil safe. The Scanpan Professional Scanpan Professional 3 Quart Sauce Pan can be used to prepare pasta or rice, prepare your favorite sauce or steam vegetables. A brushed stainless steel lid is included. 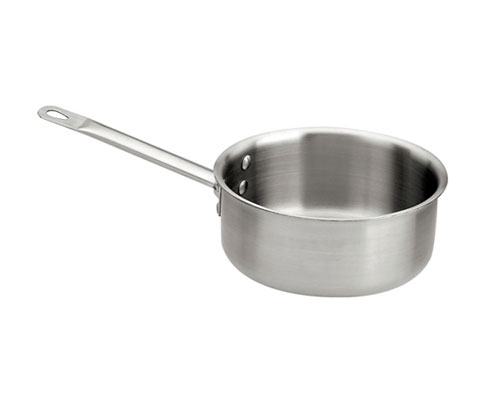 The Scanpan Professional line construction is squeeze cast aluminum encased in ceramic titanium. Nonstick surface guaranteed against warping. Oven proof up to 500F. Metal utensil safe. 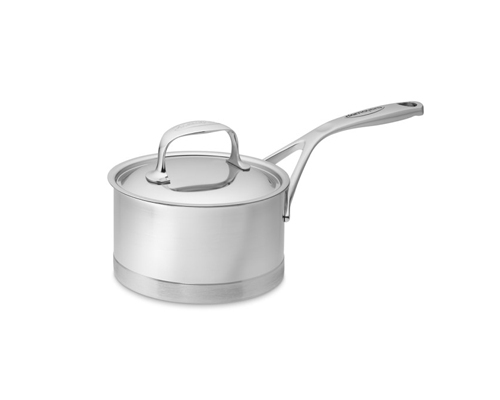 The Scanpan Professional 5 1/2 Quart Sauce Pot is the largest sauce pot available in the Scanpan Professional line of cookware. Perfect for preparing soups, stews, stocks, sauces and more. Non stick, and easy to clean. 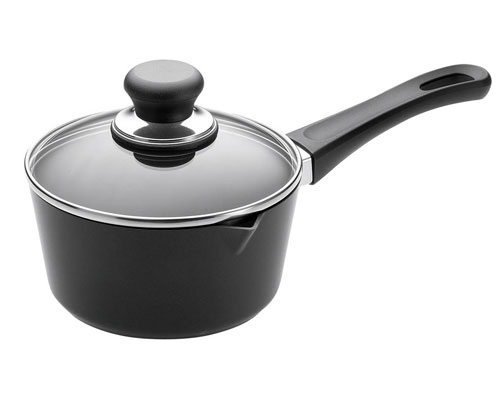 The Scanpan Professional line construction is squeeze cast aluminum encased in ceramic titanium. Nonstick surface guaranteed against warping. Oven proof up to 500F. Metal utensil safe.